The stainless steel single door wall mounted enclosure range, AFS, has an integrated sloping roof and IP 66 protection degree. The risk for component failure, and with that, unnecessary downtime is eliminated as water and dust are prevented from entering the enclosure thanks to the sloping roof and the high protection degree. The AFS range is ideal for industries such as food and beverage and pharmaceuticals, as well as almost all other environments, grade dependant. AISI 304 / AISI 316L pre-grained stainless steel. Body: 1.5 mm. Door: 1.5 mm / 2 mm for enclosures with a height of 1000 mm or greater. Mounting plate: 2 mm galvanized steel. The top of the body has an integral sloping roof at an angle of between 8 and 20 degrees, sloping towards the front, giving a 10 mm overhang, to move any liquids away from the door. Folded and seam welded. Corner formed in one piece. Surface mounted with 130° opening. Concealed AISI 304 stainless steel hinges with captive pin. Can be mounted to allow left or right hand opening (Machining is required). For AISI 316L, sealing is ensured by an injected one piece silicone gasket. Zamak double-bit 3 mm lock, with 90° movement. Stainless steel lock and other locks available on request. The mounting plate is marked vertically at 10 mm intervals, for easy horizontal positioning of equipment. On the top and bottom there are holes to facilitate cable fixing. Fixed onto M8 press welded studs to the rear of the enclosure. All sides, from 800 mm and above, are strengthened by folded edges. No gland openings as standard. Corresponds with IP 66 | TYPE 4X, 12, 13 | IK 10. Enclosure with door, mounting plate, metallic key and mounting accessories. In environments known for quick temperature changes, consideration to condensation should be taken. Please see the thermal management section. Stainless steel 304 and 316(L) single door wall mounted enclosures, with an integrated sloping roof and a high IP 66 protection degree. The integrated sloping roof reduces the customers assembly time while providing a smooth design free of joints. The installed components inside the enclosure will be safe and secure due to the high protection degree. The enclosure complies with high cleanliness requirements which makes the enclosure a good solution for industries such as food and beverage or pharmaceuticals. Labour cost is reduced thanks to the integrated sloping roof. Component failure and unnecessary downtime is avoided as water and dust are prevented from entering the enclosure. 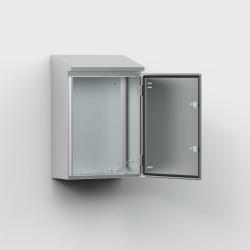 Stainless steel enclosures can be installed in almost any environment, grade dependent.